I was born in Whittington Hospital, Highgate Hill on Christmas Eve 1947. Apparently it was snowing at the time and my mums four brothers and sisters walked up Highgate Hill from Islington to visit. They brought me a Teddy Bear. We lived for a time at Sheen Grove in Islington. Some time later we moved to Nelson Road, Tottenham. It was just around the corner from Clyde Road, where my paternal grandparents lived. I think both houses belonged to the same landlord and that my grandmother was instrumental in obtaining the tenancy for us. It was a small house with two rooms and a kitchen downstairs and two bedrooms upstairs. We used the back room as a living room, and rarely used the front room. There was, of course an outside toilet, and also a lean-to made of glass which you had to go through to get to the garden. The lean-to was rather dangerous as panes of glass would fall out from it periodically, especially when it was windy. The back garden was quite long and thin, with trips of soil either side of a long path. A lady called Mrs Brooking used to come every week to collect the rent and she used to give us toffees from her pocket. I think she was either the landlord or the landlords wife. My first memory is of coming home from being sent to my mothers parents in Islington, and finding a baby asleep in my old cot in my parents bedroom. Nobody told me that I was going to have a baby sister!!! I was two and a half!! She was delivered by Nurse Faye, a well known figure in the local community. Next door to the Holts, I think, lived Mr and Mrs Mister, this always seemed a strange name to me! They kept chickens in their back garden, and had a small wooden chicken house at the end of it. I was allowed to go and gather eggs sometimes. Along the road to us lived the Pennell family  Beryl and Fred and their daughters Susan and Sally. Susan was a year younger than me, and Sally younger than my sister. They both went to Seven Sisters School, and Susan also followed me to Tottenham High School, just after we moved to Harlow. 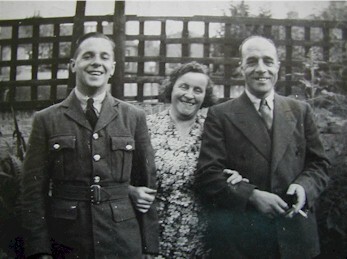 Mrs Hughes, who was their maternal grandmother, Beryls mother, lived opposite us, with her husband and their unmarried daughter Daphne. 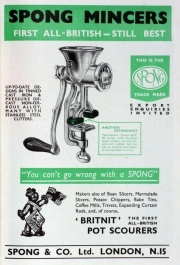 Mrs Summerville was an out worker for Spongs, and made pan scourers. You had to make a sort of doughnut with knitted metal tube, and insert a Spongs label at some point. It obviously didnt take much skill as all we children had a go at doing it, and ours looked no different from Mrs Summervilles!. On the same side of the road, but nearer to us lived the Webb family. Colin, the youngest son, I think was in my class most of the time at Seven Sisters, he had an elder brother, Edward, who was the first person I knew of who went to university. We had a milkman who delivered every day. In the early days he had a horse drawn cart, but he later moved on to an electric cart. He had bad feet and hobbled along. He was nicknamed Yoohoo Charlie as he called Yoohoo as he came along the road. There was also a baker who called at all the houses. He had a cart, but brought cakes and bread to the door in a basket. 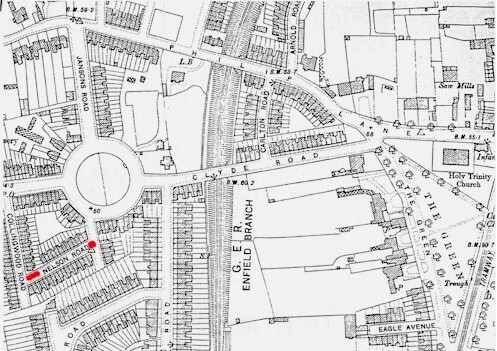 In the corner of Collingwood Road, lived a family who ran a greengrocery wholesale business from their house. The passage of their house was piled high with vegetable boxes. Their two sons Harry and Jacko went round the streets selling vegetables, Harry would carry a big basket and Jacko on a bike with a big holder containing a basket on the front. Both Harry and Jacko wore brown overalls all the time. Across the end of Collingwood Road was a small factory where fishing rods were made. A lot of the local people were outworkers for that business too. They had to attach rings to the rods by winding cord round them. This required rather more skill than making Spong Scourers! My grandparents lived in a larger house in Clyde Road. They had been there for some years. They had a kitchen, and two rooms downstairs, and three bedrooms upstairs. There was an outside toilet. My grandmother had a bathroom extension put on the back some years after my granddad died. The gas and electricity meters were high on the wall in the hall, and I can remember my grandparents having to balance on the newel post of the stairs to put pennies in them. My granddad grew geraniums in the lean to at the back of their house. I can still remember the way they smelled. My grandmother was a machinist at Mills Equipment in Broad Lane. I think she had worked there during the war and continued afterwards. Mills Equipment made webbing and leather goods for soldiers, but I dont know what they made after the war. My grandmother used to bring shopping bags home that were made from canvas which I assume shed made at work. My grandmother used to work some Saturday mornings and my grandfather took me to meet her when she finished work at 1 oclock, and we hid behind the tombstones in the church in Broad Lane. My grandfather worked for Maples in Tottenham Court Road. His father was the garage manager there, and his brother, sister and brother in law worked there too. My father went there to work when he left school. According to him, he was made to use another name when he went there so that his grandfather could not be accused of nepotism. My grandfather did removals for Maples and my sister and I had a Maples wicker crate to use for our toy box until my mother discovered it had woodworm and threw it out. When my grandfathers brother in laws sight began to deteriorate the firm allowed him to just drive in London rather than nationwide! My grandmother sometimes took me up to London to meet my grandfather from work, and we would meet him in a street near Maples garage and I was allowed to ride in the cab of the lorry back to the garage  a very exciting experience. I would have been about five or six. I think. There was an off licence on the corner of Clyde Road and my granddad used to send me there to buy his cigarettes (20 Craven A) and his Mackesons stout which was on draught, and which I carried in a jug. My grandfather used to buy biscuits from a jar which was kept on the counter to give to the off-licence dog. In the opposite direction to this, towards Lawrence Road was a baker which sold delicious bread and cakes and a newsagents shop called Bridcutts where I used to buy sweets and comics. The son of the family was older than me would often be serving behind the counter, he never seemed to go to school, and I used to wonder why. Back towards the other direction, but on the other side of the road was Bush Hill Park Laundry. My mother used to send our laundry there to the bagwash  where everything was put into a large bag and washed. It was returned wet for you to dry at home. You had a number which was printed on the bag to identify it. Ours was D13N. We went to both a doctor and dentist in Philip Lane. The doctor was Dr Leibster and the dentist was Mrs Zeibotz. I think both were both Jewish and presumably fled from persecution in the war. 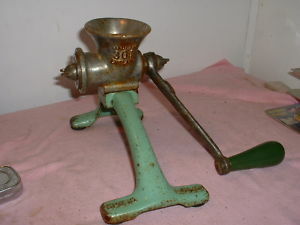 Mrs Zeibotz had a foot operated dental drill which was like an instrument of torture and she used to give us bits of Mercury fillings to play with. 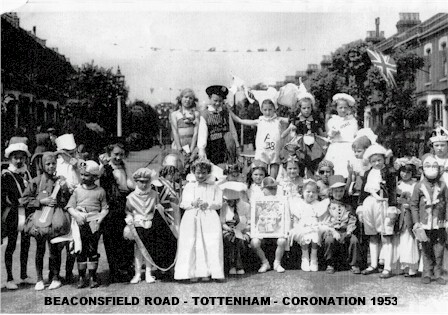 In 1953 we went to a coronation street party in Russell Road, where my grandmothers family lived. My sister and I were going to be dressed as Hula girls with grass skirts and lowers round our necks. We were disappointed because our mum made us wear vests because we had recovering from chicken pox. It quite spoiled the effect!!!! I remember starting at Seven Sisters Infant School when I was just over four and a half. My teacher was Miss Brownjohn, and we were all made to lie down on a camp bed every afternoon for what seemed like ages, but I guess was only half an hour. We were also given a dose of National Health Orange juice- we all used the same spoon I seem to remember. One day, Miss Gow, the headmistress, came into our classroom, called out a list of names, and those whose names were called out were moved up into the next class. I think I was reunited with my ex-classmates later up the school. The toilets were in a brick building on the far side of the playground and were approached down a sort of tunnel. They were extremely cold in the winter. When I was seven, I was May Queen for the May Day festival. How this came about I dont remember. My mum had a dress made by a lady who lived near my nan and granddad who was a dressmaker. 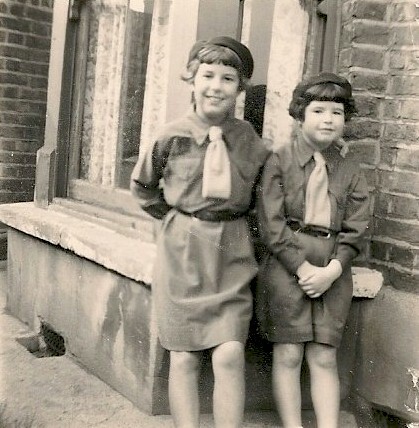 She had also made matching gingham dresses and knickers for us in various colours when we were smaller. In the juniors we had separate playgrounds and entrances for the girls and boys. 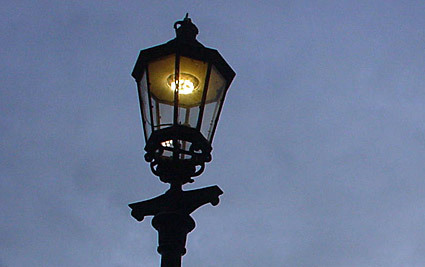 Downhills Park and Lordship Rec. were popular places to play and we often went to play in either or both with our school friends after school or in the holidays. I learnt to ride my first two wheeler in Downhills Park. I can also remember that once the whole school walked up to the Rec where a track was laid out for us to use for our sports. We also used to go to Chestnuts Park to play rounders. 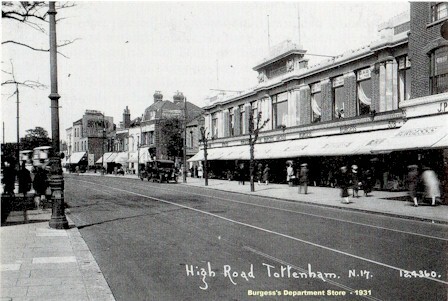 We used to do our shopping in Tottenham High Road on Saturdays. When the Spurs were at home, the road was full of supporters. We were able to go into the stables at Tottenham Police Station to see the Police Horses and give them sugar lumps. We would often go to Burgesss stores where we would have our feet measured in an x-ray machine. My favourite pair of shoes at that time were cream coloured leather. They had a strap that could go over my feet, or swivel round the back. We were taken to see Father Christmas in Burgesss at Christmas, where they also had a roundabout for children to ride on. 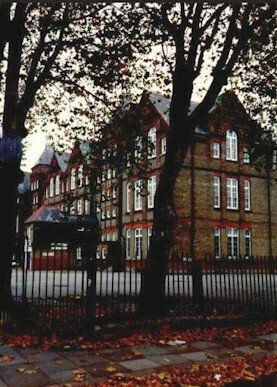 I enjoyed my time at Seven Sisters  especially when I moved up into the juniors. Miss Mason was my teacher for the first two years, and Mr Rothwell for the last two. Mr Sutton was the headteacher. I think it was a very good school. 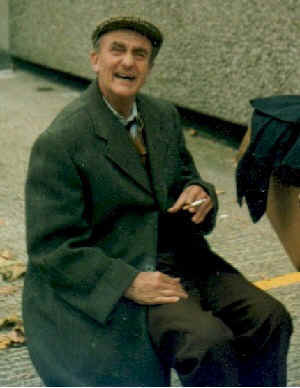 Other teachers I remember are Mr Spinks, who drove a bubble car, Mr Hammond, Mr Jones and Miss Godfrey  who used to take the girls for sewing when Mr Rothwell took the boys for something - I have no idea what. 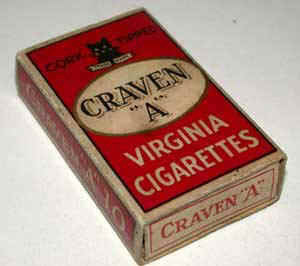 We used to go to the shop on the corner of Seaford Road for Miss Godfreys Du Maurier cigarettes in a red flip top box. Miss Godfrey had long well-manicured finger nails, and Miss Gray. 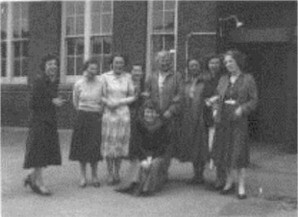 Teachers at Seven Sisters Junior School when Sue was a pupil. In 1959 when I was in the top class we went to St Marys Bay on a school journey. I think that the place we stayed in was an old army camp. It certainly looked like one. Four teachers came with us: Mr Rothwell, Miss Godfrey, Miss Gray and Mr Jones. We had a good time, visiting many places in the area. I had my first trip on the Romney, Hythe and Dymchurch Railway during this trip and also went to Canterbury Cathedral which I visited again when I was studying Chaucer for A levels many years later. There were some large trees in the corners of the girls playground and we used to play rounders using them as bases. We also used to skip, play two balls up against the wall, and sit on the ground and play jacks or fivestones which we also called gobs. I can remember using dip in pens for writing, and also mixing up ink using powder in the cloakrooms. It was a very messy job! There was a sort of greenhouse in the roof of the school which was used as a sort of storeroom. Some of us went up there once with Mr Sutton. I cant remember why. I think it was to carry something down. It was extremely hot and very dusty. I went back to Seven Sisters as a teacher in 1970. I regret not going to have a snoop around before I left. I taught at Seven Sisters in the infants for three years. Miss Gow, the headmistress was still there, and Miss Dowdell who had taught me was the deputy head. I went to Miss Dowdells retirement party some years later and met up again with Miss Brownjohn who had been my first teacher. She had been living in Canada for some years and didnt seem to have changed a bit!!! I sat my eleven plus in 1959 and was given a place at Tottenham High School, and I went there with three other girls from my class. My mum took me to a shop near Bruce Grove to buy my uniform, and we also bought a leather satchel from a shop up there too. 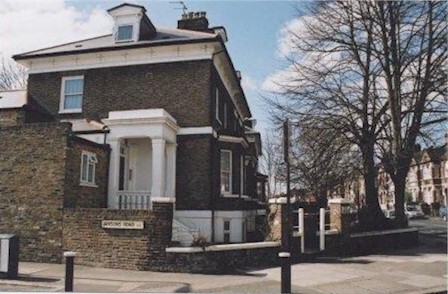 I spent a very happy year at Tottenham High, but left after one year when my family moved to Harlow in Essex, after my dad had built a new house for us. 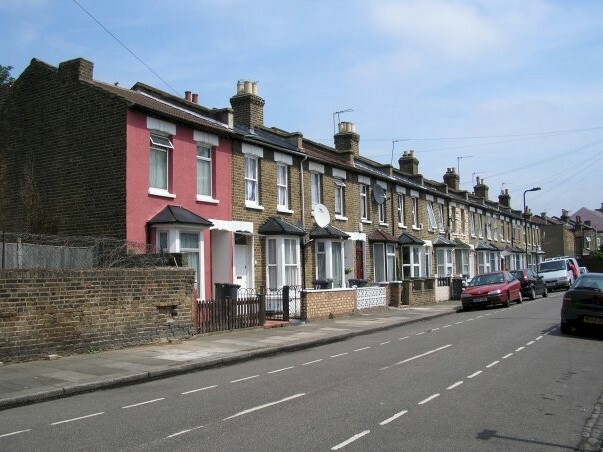 We had been on the housing list in Tottenham for several years when, in 1958 we went on holiday to Kent with my mothers family. My dad had never been one to sit and do nothing, and so one day when he was feeling a bit bored he bought a Do It Yourself magazine. In the magazine was an article about Self Build groups. My dad and one of my uncles had a bit of a discussion, and when we got home they set about organising the Main Line Self Build Group. In the space of a few years 28 houses were built in the then Harlow New Town, and we were no longer residents of Tottenham!